Yes, we know it’s summer, and you’re all making the most of enjoying the beautiful sunshine, Wimbledon, Strawberries & Cream, Champagne and Pimm’s – but it’s not long now until Christmas… Yes we’re sorry to have to remind you, but Christmas is less than 6 months away! It’s the most wonderful time of the year, and here at Beaufort House Chelsea we want to help you make Christmas 2013 the best one yet by helping you plan the perfect Christmas Celebration. It’s really is never too early to plan your Christmas Party, and that isn’t a myth – we are already booking out fast in December, so it really is a great idea to get your Christmas Party venue sorted as soon as you can to avoid disappointment. So whether you are organising a Corporate Party for all your work colleagues, a large dinner with family, drinks & nibbles with friends or a huge Christmas Bash for everyone to enjoy, Beaufort House is the perfect venue in the heart of Chelsea. For more information please call our dedicated Events team on Tel: 020 7352 2828 or click Christmas Party Brochure 2013 to download the brochure. 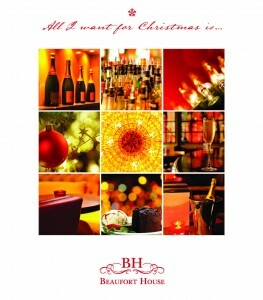 We look forward to welcoming you to Beaufort House to make it a December to remember!